Macy Chiasson is a natural featherweight. She competed at featherweight on The Ultimate Fighter 28, and ended up winning the season at that weight. 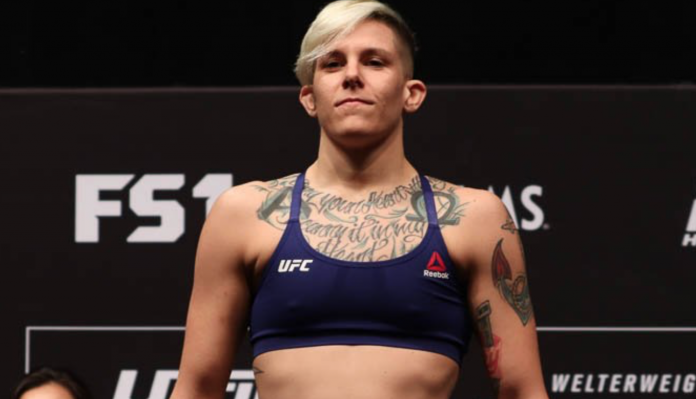 However, she is moving down to bantamweight for her next fight, which will pit her against Gina Mazany at UFC 235 on March 2. This is a rather interesting move for Chiasson given the fact she has fought her entire career at 145 and won TUF at featherweight. Yet after talking to her coaches and working with the UFC Performance Institute, she decided the timing was right to move down a division. While the UFC featherweight division is notoriously thin on fighters, Chiasson says this wasn’t a big part of her decision to drop to bantamweight, though it definitely helps that there are more fighters in that division. As Macy Chiasson gears up for this drop to the bantamweight division, some fans have worried that she might struggle with the weight cut. She says that won’t be a problem. A big part of her confidence comes from the fact that she is working with the UFC Performance Institute to assist with her nutrition and weight cut. Even though the fight is not for three months, she is already in the process of slimming down. There is no looking back now, Macy Chiasson will fight at bantamweight next but isn’t closing the door on returning to featherweight. The hope is the UFC builds up that division so she can fight often, between both divisions.